Back in 1994 Novaseal® became a leading international brand known for design innovation, engineering solutions and manufacturing excellence. Products solve manufacturing and production critical issues and evolving business challenges for heat sealing production of various materials used in the manufacture of signs, banners, posters, billboards, shade, drapery, civil/geotech, medical and other industrial products. As a 100% Made in USA, our company and values are held to a higher standard. We accept that responsibility. And have designed into each of our products features that result in longer lasting machines. Our machines are built to last a long time. For this reason we’re the only heat sealing company to offer a 5-Year Warranty (that can be renewed indefinitely). Our engineered heat sealing solutions use proprietary technologies‡ and methods resulting in excellent sealing results with higher energy efficiency (less power), seals that look great and are 100% reliable. Pre & post sales support is of utmost concern to us. NovaCARE™ is our web-based 24/7 online customer service designed to meet our customers’ needs and individualized requirements. Most of our machines are modular in design which means that our lead times on customizable machinery is very good and often quite less than expected. Design excellence and flexibility is what makes Novaseal®-branded products best-in-class for the markets we serve. When you want and can afford the best, look no further than Novaseal®. All Novaseal®-branded products are in fully compliant with the Berry Amendment (USC, Title 10, Section 2533a) for DOD procurement of domestically manufactured products. Back in 1994, Novaseal Corporation got its start in Broomfield, Colorado as an engineering designer and manufacturer of Novaweld-branded wedge welders for sealing geosynthetics ... geomembranes, geotextiles and gcls. Novaseal Corporation was actually the first to manufacture wedge welders. With the popularity (thousands purchased world-wide) of the hand-held GT-100 Wedge Welder, Novaseal’s line expanded with semi-automatic wedge welding machines (GT-200, GT-500) and relatively soon thereafter became the “go to” name for heat sealing geotextiles, HDPE, vinyls, and virtually all materials used in civil engineering and industrial markets. In 2002, Novaseal Corporation and High Tech Automation merged and moved to Boca Raton, Florida. Ten years later, Novaseal Corporation moved to Coconut Creek, Florida. 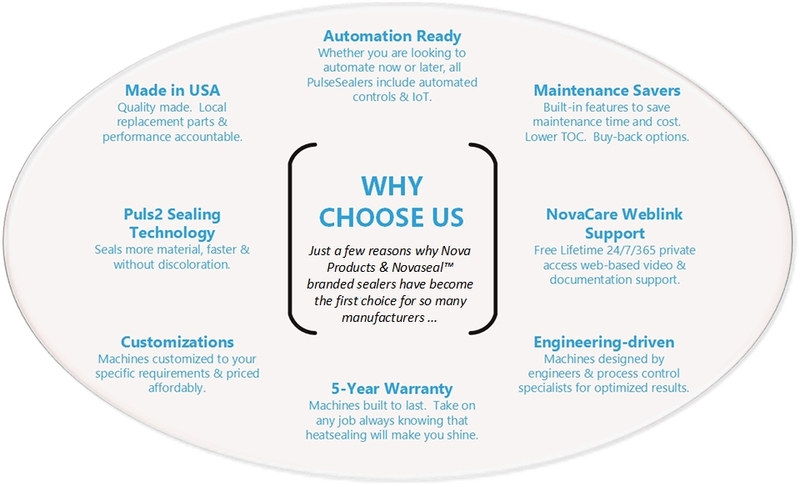 Beginning in the summer of 2016, Novaseal®-branded products were manufactured by Nova Products Mfg, Inc., an employee owned company, and include a full line of standard and customizable products. With Nova Products we also introduced lease and financing options as well as broadened our product line to include automation/robotics and filtration products. Our standard products include a technology‡ developed to combine attributes of RF High Frequency sealing with more traditional impulse welding to form a proprietary, patent pending method, referred to as Puls2™ Sealing Technology. Pulse Sealing is limited for sealing straight (not curved) seals. It can be used to seal virtually all thermoplastic materials, and with available sealing tapes, all thermoplastic/thermoset materials, without deformation, color distortion and at rates significantly faster than competitive technologies. Nova Products continues to manufacture and distribute its internationally acclaimed line of Novaseal®-branded wedge welders, however with improved manufacturing and reliability methods. Although sealing technologies have improved over the years since the late 1950’s when Mr. Lippman's father pioneered RF welding, with advanced programming techniques and manufacturing methodologies, we still believe in our mantra, “there’s literally no application we can’t solve.” All machines are engineered, designed and manufactured in the United States using American Ingenuity with a focus on Innovation and affordability. Note‡. Novaseal® technologies developed via a licensing partnership relationship.